Ponce de Leon is said to have named this place after the Bay of Biscay in his native Spain. A reef near the northern end of the park is dubbed “Fowey” after the British warship that wrecked near there in 1748. The pirate Black Caesar discovered hiding places in the network of mangrove-lined channels, and a creek in the distance to your right now bears his name. The history of exploration is written on the land. 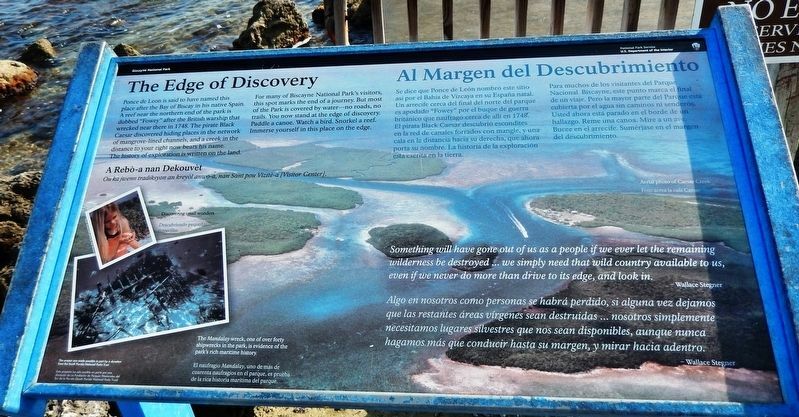 For many of Biscayne National Park's visitors, this spot marks the end of a journey. But most of the Park is covered by water — no roads, no trails. You now stand at the edge of discovery. Paddle a canoe. Watch a bird. Snorkel a reef. Immerse yourself in this place on the edge. cala en la distancia hacia su derecha, que ahora porta su nombre. La historia de la exploración está escrita en la tierra. Para muchos de los visitantes del Parque Nacional Biscayne, este punto marca el final de un viaje. Pero la mayor parte del Parque está cubierta por el agua sin caminos ni senderos. Usted ahora está parado en el borde de hallazgo. Reme una canoa. Mire a un ave. Bucee en el arrecife. Sumérjase en el margen del descubrimiento. Something will have gone out of us as a people if we ever let the remaining wilderness be destroyed… we simply need that wild country available to us, even if we never do more than drive to its edge, and look in. Algo en nosotros como personas se habrá perdido, si alguna vez dejamos que las restantes áreas vírgenes sean destruidas… nosotros simplemente necesitamos lugares silvestres que nos sean disponibles, aunque nunca hagamos más que conducir hasta su margen, y mirar hacia adentro. The Mandalay wreck, one of over forty shipwrecks in the park, is evidence of the park’s rich maritime history. El naufragio Mandalay, uno de más de cuarenta naufragios en el parque, es prueba de la rica historia marítima del parque. This project was made possible in part by a donation from the South Florida National Parks Trust. Este proyecto fue posible en parte gracias a una donación del South Florida National Parks Trust. Location. 25° 27.802′ N, 80° 19.861′ W. Marker is in Homestead, Florida, in Miami-Dade County. Marker can be reached from Southwest 328th Street 2.8 miles east of Southwest 117th Avenue (Colonial Road) when traveling east. Touch for map. 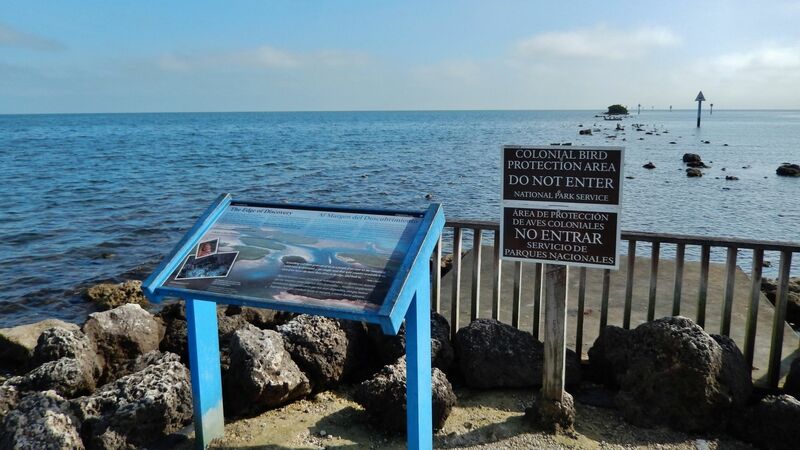 Marker is located at the east end of the Maritime Heritage Trail, near the Dante Fascell Visitor Center in Biscayne National Park. Marker is at or near this postal address: 9700 Southwest 328th Street, Homestead FL 33033, United States of America. Touch for directions. Other nearby markers. At least 8 other markers are within 9 miles of this marker, measured as the crow flies. The Edge of "Progress" / Al Margen del "Progreso" (approx. ¼ mile away); Hurricane Andrew (approx. ¼ mile away); Coral Castle (approx. 7½ miles away); Cooper Residence (approx. 7.6 miles away); Redland District (approx. 9.1 miles away); The Hotel Redland (approx. 9.1 miles away); Palm Lodge (approx. 9.1 miles away); Landmark Hotel (approx. 9.1 miles away). Touch for a list and map of all markers in Homestead. More. Search the internet for The Edge of Discovery / Margen del Descubrimiento. Credits. This page was last revised on April 6, 2019. This page originally submitted on April 6, 2019, by Cosmos Mariner of Cape Canaveral, Florida. This page has been viewed 55 times since then. Photos: 1, 2. submitted on April 6, 2019, by Cosmos Mariner of Cape Canaveral, Florida.